BEVERLY — Chicago is commonly known as Chi-Town, The Chi and lately Chi-Raq. But Raven Smith said she and her friends at Morgan Park High School prefer the nickname The Go. It’s this nickname that Raven hopes will rebrand the city in a more positive light. To that end, the senior from Roseland is behind the “Straight from the Go” T-shirt campaign and is seeing a surge of interest. “I want to let people know that Chicago is a good place to come,” soft-spoken Raven said last week. Raven, 17, said she came up with the idea over winter break. Designed to resemble the Chicago flag, the baby blue shirts debuted Dec. 26 at the Proviso West Holiday Basketball Tournament. Members of the top-ranked Mustang boys basketball team wore their classmate’s shirts during pregame warmups. From there, things began to move quickly. Raven’s parents, Joshua and Eraina Smith, first made sure their daughter’s idea was trademarked and helped launch a website. Sales were driven, in part, by media interest. Raven has made appearances on Windy City Live, CBS2 and WVON-AM 1690. Meanwhile, T-shirt sales have expanded beyond the website and out of Raven’s backpack. 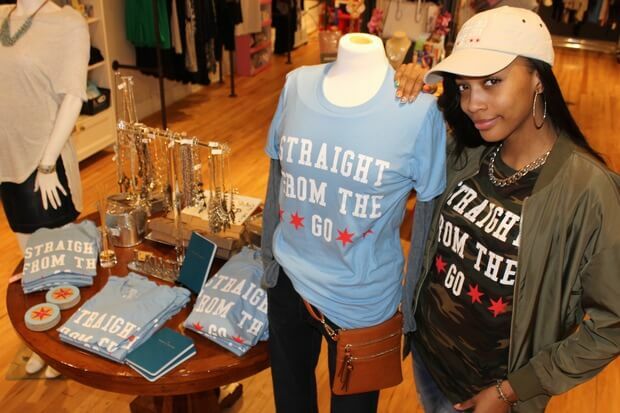 The Shop 147 has been selling The Go shirts since January from its store at 7225 S. Stony Island Ave. in South Shore. And Raven nearly sold out of shirts at a table she set up in the lobby of a prayer service headlined by the Rev. Michael Pfleger on Feb. 27 at St. Barnabas Parish in Beverly. Belle Up, a maternity and women’s clothing store, also began selling Raven’s shirts at its flagship store in Beverly as well as its Downtown location on the Magnificent Mile about two weeks ago, said Jamenda McCoy, owner of the boutique. “I knew my customer base would love the tees. But, more importantly, I wanted to work with Raven because I strongly believe that it’s important to give young people — especially young entrepreneurs — a platform,” said McCoy, a Beverly resident. This, too, has personal meaning for Raven, who said her Straight from the Go campaign also was inspired by the death of Sakinah Reed, who was killed in a drive-by shooting Jan. 5. Raven’s 17-year-old friend was standing outside at 76th and Dorchester Avenue in South Shore when she was struck twice by bullets in her back and once in her leg. Sakinah, a former Phillips High School basketball player, died at Advocate Christ Medical Center. Despite creating a clothing line that resonates so deeply, Raven is planning to study athletic training next year at Millikin University in Decatur. This decision also comes despite having worked as a model from age 13-17, appearing in ads for Kohl’s, Nike and Meijer. Regardless, Raven pledged to keep her T-shirt company going while in school. She’s also hoping to pick up more retail partners. McCoy, of Belle Up, said she expects the shirts to continue to sell, fueled by their powerful message. “I’ve traveled all around the world, but I’m a Chicagoan through-and-through. To me, Straight from the Go is about Chicagoans standing tall and beginning to change the conversation around and about the city we love,” McCoy said.